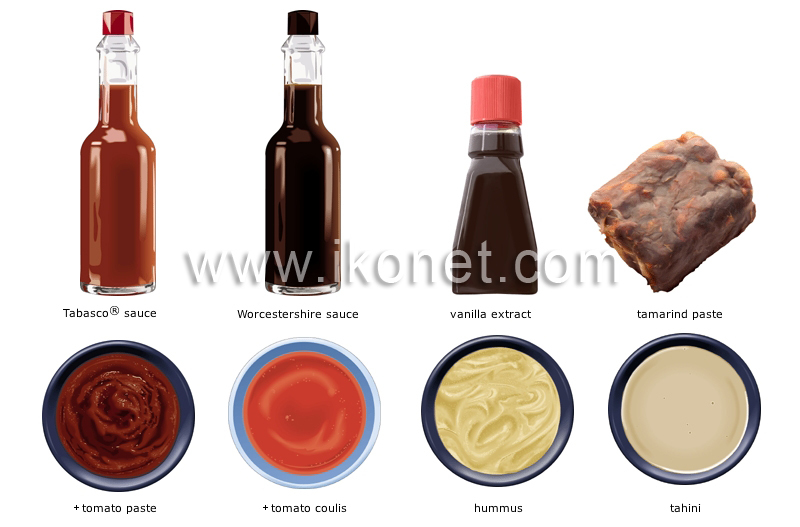 Natural or artificial substances used in cooking to bring out the flavor in a dish or to complement it. Aromatic substance extensively used in baking; it is often made of artificial ingredients that are less tasty than real vanilla, which is more expensive. Made from the fruit of the tamarind tree, this slightly acidic paste is used as a foodstuff and as a condiment in Asian cooking. British sauce whose exact recipe is kept secret by the manufacturer; its robust flavor goes well in cocktails, sauces, soups and many other dishes. Native to Louisiana, this sauce is made from crushed red chile peppers and is so pungent that a few drops are enough to season a whole dish. Thick creamy nutty-tasting paste, made of ground sesame seeds; it is added to sauces and served with brochettes, bread, fruit and vegetables. Lebanese condiment made from puréed chickpeas and sesame oil, commonly served as an hors d’oeuvre or with crudités. Tomato purée of medium thickness that is served either hot or cold, as a sauce. Tomato coulis reduced until it turns into a paste; it is used to make ragouts and sauces.